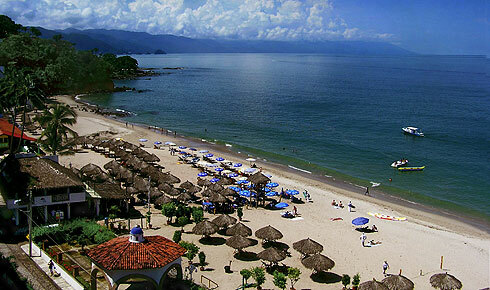 Puerto Vallarta's favorite beach, Playa de los Muertos, lies beckoning at your feet. Yet another sight for you to absorb and enjoy as you relax on your private balcony - day or night - sipping on a margarita - watching the nightly fireworks display - or simply putting up your feet and dozing to the soothing lullaby of the surf. 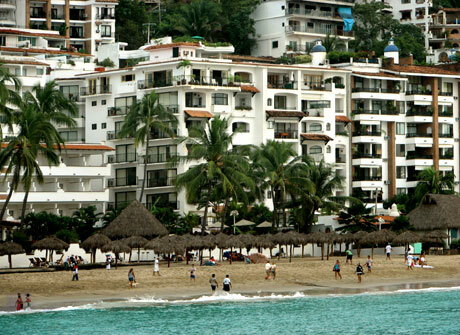 The One Beach Street building, formerly known as Playa del Sol, as seen from Puerto Vallarta's most popular beach, Playa de los Muertos. 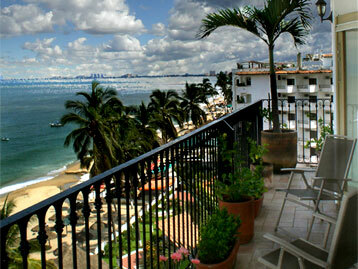 Your penthouse is the left uppermost unit, with the palm tree. 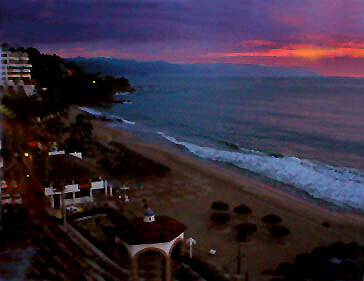 This enviable location results in spectacular coastline bay views, some of which you see below. The entire sweep of Bahia de Banderas lies before you as you step out onto the penthouse balcony - now you will realize why this is known as the Mexican Riviera. 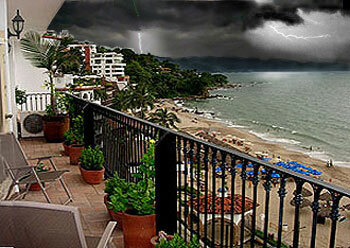 This is the Costa Banderas. From jade green jungle clad Sierra Madre Mountains, to Punta de Mita in the North and Cabo Comentes in the South, this is the second largest natural bay in North America - a sight to behold and remember. This glorious vista changes throughout the day from the soft mists of pre-dawn, to diamond sparkling waves at noon, to magnificent sunsets, even an approaching storm adds its own visual splendor to this living canvas. And what an experience to see a full moon hovering above the bay as dolphins play in the moonlight. 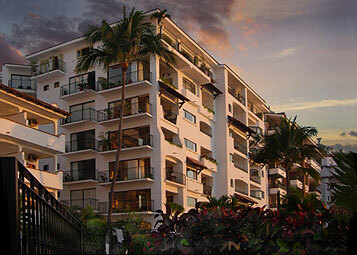 Bathed in the golden glory of yet another famed sunset on the Costa Banderas, your luxury Puerto Vallarta vacation rentals penthouse now awaits your arrival -- awaits to enrich your life with golden memories of your Puerto Vallarta Dream Vacation.